I know what you are thinking… and no, it is not too early. 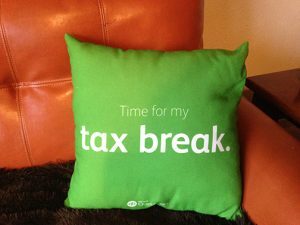 I’m a bookkeeper, not a tax preparer, but that doesn’t mean I don’t have a role in my client’s tax preparation each year. I save them a ton of time and money getting ready. As we approach year-end, it’s time to start getting those files ready for the poor soul who has to do all the tax work. Just kidding. I have CPA friends! The thought of doing a thousand 1040s frightens me on a deep level. But I respect the people who do it every year: they are committed. 150-hour work weeks, dealing with upset clients because the return wasn’t what they “envisioned,” having to deal with receipts-in-a-shoebox or difficult clients…. If you haven’t been using a bookkeeper, and your year-end is way off from last year’s and you can’t explain it, you might want to find a bookkeeper to help identify errors. Small business tax preparation doesn’t have to be a drag. Well, except for the part where you pay taxes, but your bookkeeper can help with quarterly estimated payments. But the thing is, if you outsource your bookkeeping or rely on a professional, it’s a breeze. 50% of businesses fail within the first five years. 89% of business survive because they use a bookkeeper or accountant. Good luck and let me know when I am able to help.